7/8 yard for binding. 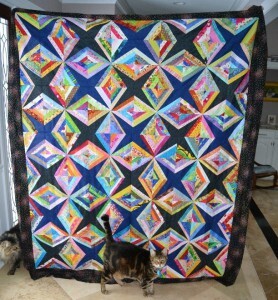 For added interest, use excess binding from other quilts and stitch them together for an even scrappier finish. Not needed for class. I will provide the template for the star points. Recommend you re-cut this with template plastic. If you sew on paper stabilizer this will dull your needle more quickly. It is a good idea to use a larger needle and change it frequently. Pluses and minuses of different stabilizers. Paper backings need to be removed from your quilt top at some point. This is a very inexpensive way to foundation piece string quilts but it can be time consuming and the paper will make a lot of ‘dust’ when you remove it. Muslin is a good choice but it will add extra weight to your top. If you use muslin, suggest you wash it first to preclude any future issues with shrinkage. I currently use and recommend Sheer Delight (Approx $3.00 per yard). It doesn’t need to be removed or add extra weight. Fusibles and interfacings are not recommended as stabilizers. Try different products and use what you like. One Loose Thread and Pieces & Patches Quilt Shop stock Sheer Delight. Contact Joyce Greer by email 630P@Bellsouth.net to order from One Loose Thread or Pieces & Patches by phone 803/359-3442 or email Shirley.piecesandpatches@gmail.com. If you order from Joyce Greer, I can bring your order to class and save the mailing expense. Students have the option of an alternate design during the same class. 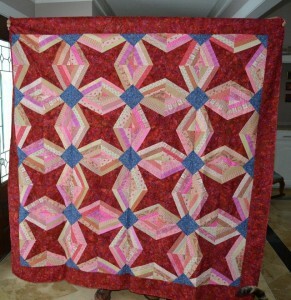 Version two also requires 2 ½ yards for the star points and border. Note, version two is smaller than version one. If you want to increase the size, you will need additional yardage. The diamonds, blue in this quilt, require ½ yard of fabric. Version two is made with a specific color of scraps, creams and pinks. Students have the flexibility to use specific colors or make it scrappy like version one.